The narwhal looks like something out of mythology. Males have a long, spiral tusk that’s earned them the nickname “the unicorn of the sea.” The narwhal sounds a bit fictional, too -- a bit like a droid from Star Wars. 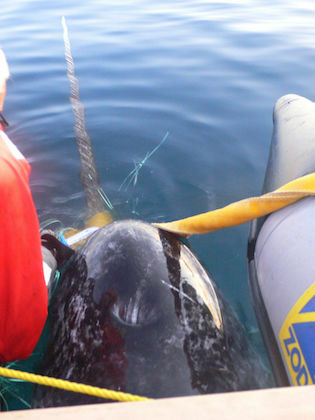 Researchers recorded the sounds of the East Greenland narwhal. It’s found in a fjord on the central eastern coast of Greenland. The project was designed to reveal details about the lives of these elusive creatures. In addition, more ice-free conditions in the years ahead are expected to bring more boat traffic and oil exploration. That’ll increase the underwater noise, perhaps altering the narwhal’s behavior. The study will help biologists assess those changes. From 2013 to 2016, researchers attached tracking devices equipped with recorders to one male and five females. The trackers stayed in place for a few days, then floated to the surface. The scientists recovered the devices and analyzed the recordings, which were the longest ever made of narwhals. The whales use echolocation to find and track prey. They emit a series of clicks to find the prey, then a “buzz” when they close in for the kill. The animals in the study typically hunted at depths of about 1,000 to 2,000 feet, although they sometimes went up to a mile deep. Near the surface, where they spent more than half their time, they “called” other narwhals -- staying in touch with other unicorns of the sea.